The five steps in the Centers for Disease Control and Prevention's Building Resilience Against Climate Effects - BRACE - framework for identifying and evaluating health risks stemming from climate change. • Step 1: Anticipate Climate Impacts and Assess Vulnerabilities - Identify the scope of climate impacts, associated potential health outcomes, and populations and locations vulnerable to these health impacts. • Step 2: Project the Disease Burden - Estimate or quantify the additional burden of health outcomes associated with climate change. • Step 3: Assess Public Health Interventions - Identify the most suitable health interventions for the identified health impacts of greatest concern. • Step 4: Develop and Implement a Climate and Health Adaptation Plan - Develop a written adaptation plan that is regularly updated. Disseminate and oversee implementation of the plan. • Step 5: Evaluate Impact and Improve Quality of Activities - Evaluate the process. Determine the value of information attained and activities undertaken. WASHINGTON – An Arizona program aimed at curbing health problems that have come with higher temperatures was cited Tuesday as a model for other local governments coping with climate change. Arizona was one of seven states and cities highlighted in a report by the Centers for Disease Control and Prevention and the American Public Health Association. That report was cited by the White House as the president unveiled a series of actions to fight climate change and the effects it has on public health. 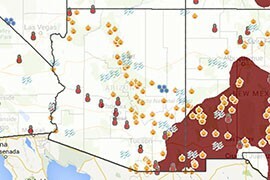 Arizona’s Extreme Weather and Public Health program, funded with a CDC grant, targets health issues associated with rising temperatures and other extreme weather events caused by climate change. Under the program, the state Department of Health Services teamed with the National Weather Service to create a heat emergency communication plan that uses email and social media to get alerts out to health services, schools and residents. “Toolkits,” with brochures and other information, were also used to target children and older adults, the most heat-vulnerable populations. Arizona is one of 18 states and cities currently funded by the CDC’s Climate-Ready States & Cities Initiative. Other grant recipients cited in the report as success stories included San Francisco, New York City, Minnesota, Maine, Michigan and California. The CDC initiative follows a five-step Building Resilience Against Climate Effects, or BRACE, framework. It involves identifying possible health issues resulting from climate changes, identifying possible solutions and then evaluating their effectiveness afterward. So far, the March report said, the program has helped public health officials across sectors coordinate with each other and helped residents “adapt and respond” to flooding and wildfires. The president acknowledged the health costs that can occur as a result of skyrocketing high temperatures. His remarks came after a roundtable discussion at Howard University on climate change concerns. Donna Bryson, program manager and lung health educator at the Tucson chapter of the American Lung Association, said that asthma triggers differ from person to person. But an increase in any particles that can trigger an attack, such as smoke from wildfires or pollen from a warmer extended spring, could be an issue for most asthmatics. “Anything that causes an increase in triggers can cause an increase in asthma symptoms,” she said. Actions unveiled by the president Tuesday included everything from releasing toolkits for health care facilities to convening workshops to improving air quality data. 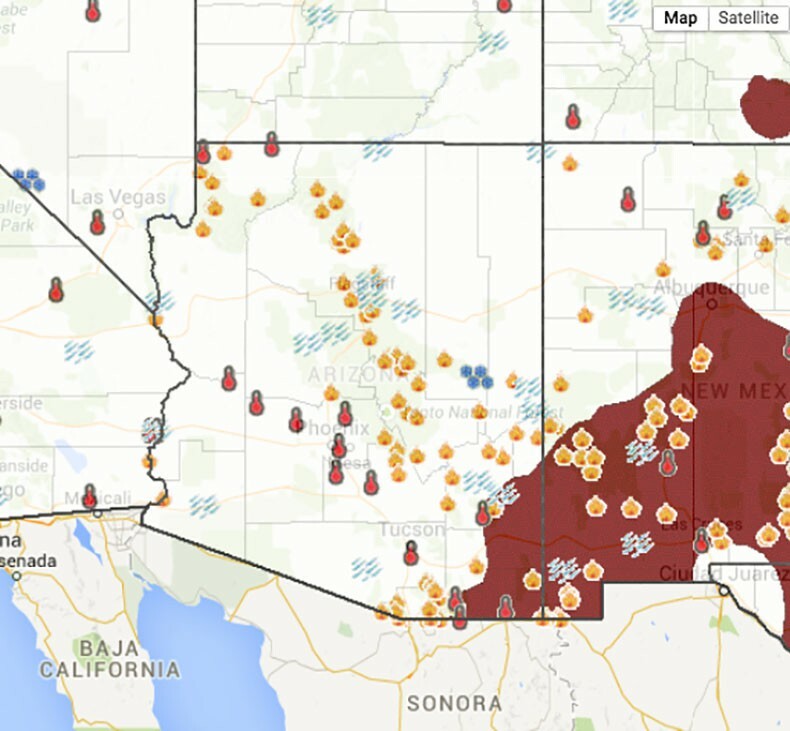 A Natural Resources Defense Council map shows extreme weather events - from high temperatures to floods and wildfires - in Arizona that it says are linked to climate change.